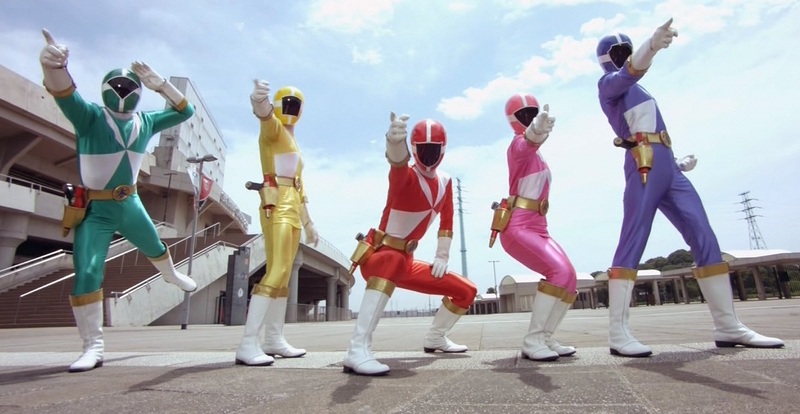 For those not in the know, in Tensou Sentai Goseiger, the season of Super Sentai adapted into Megaforce’s first season, the Rangers were actually angels. Well, kinda angels, anyway. They’re called Gosei Angels, come from a place called Gosei World, and blend in with humanity to generally guide and protect them. 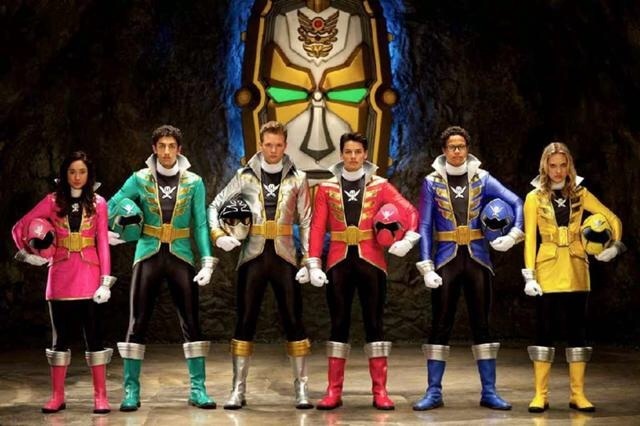 And given Jonathan Tzachor’s love of directly translating the Sentai, I thought that it would actually be an interesting twist on that (and would also fit with Super Megaforce, which was adapted from a season where the Rangers weren’t from Earth) if the Megaforce Rangers were actually from Eltar, having to blend in with humanity while defending them from Warstar forces, and meet up with Zordon’s apprentice, who grants them their Megaforce powers. Granted, you’d wanna make sure they didn’t go full-blown on reusing the stories from Goseiger, and do NOT show them with wings at any time. Also, doing this would make Troy’s Super Saiyan “I AM A MAN!” punch to Robo Knight make a lot more sense, since he could’ve been channeling power from Eltar, which we’ve established was enough to fuel the Turbo Zords and powers. Look, I have no problems with them reusing Go Go Power Rangers for Megaforce (although I would’ve gotten Ron Wasserman to produce and sing the remix), nor do I have a problem with their morphing call being “Go Go Megaforce!”…Or rather, I WOULDN’T mind them doing those two things if it was JUST for Megaforce. However, these are both carry-overs from Samurai, which had no business using either of those things. 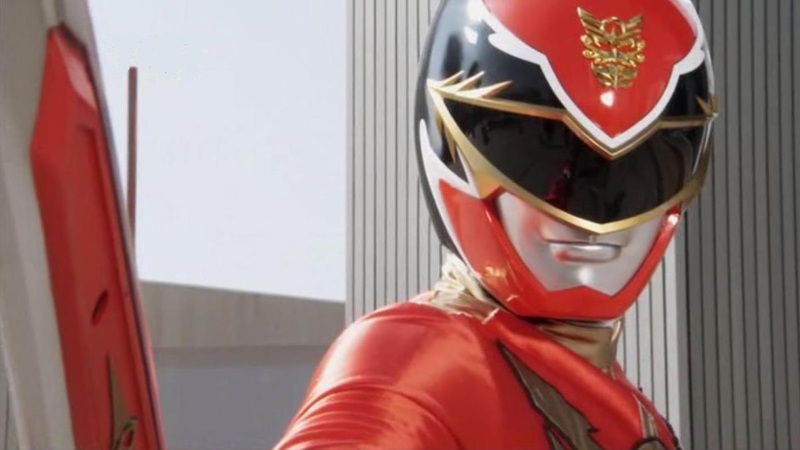 I’ve said it before and I’ll say it again, Samurai should’ve had its own unique theme with a Japanese tone to it, and the only reason it didn’t was so Saban could continue the theme of “Power Rangers is back!”. 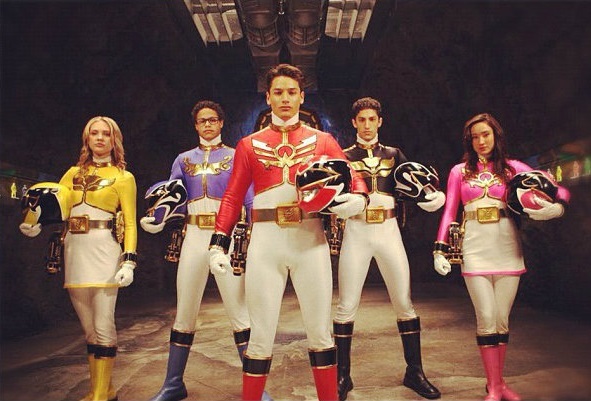 It would’ve been far more meaningful and make more sense if Go Go Power Rangers was saved for Megaforce. And if I may be allowed to go on a tangent (too late, lol), I know that there was originally going to be a different theme done for it, but this was vetoed by interference from Nick, and that the theme for Dino Charge is another remake of Go Go Power Rangers, all because Nickelodeon insists on using the old theme. Again, I don’t mind the song being used for Megaforce, since it’s the 20th Anniversary season. However, I DO mind it on the grounds for why it’s ACTUALLY being used. 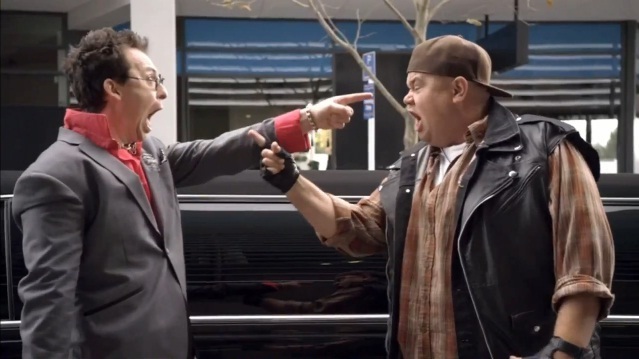 That said, at least Dino Charge is an ACTUAL remake, and very energetically…well, for a lack of a better term, CHARGED. And in terms of “It’s Morphin Time!” being used as a pre-morphing call order of sorts…Meh, I don’t really mind, honestly. As someone who’s used it myself in that same manner for my own Power Rangers story, I can tell you it works a hell of a lot better than the oftentimes used “READY?!”. I guess “Let’s Ranger Up!” is decent enough, but I just prefer “It’s Morphin Time!”. Just personal preference, really. Basically, among the Armada would be a group of space pirates who got mind controlled into becoming evil Rangers and wind up stealing the Legendary Keys from the Command Center. The two teams get into a massive battle until a monster from the Armada takes the keys when it looks like the evil Rangers might lose. The pirates are freed from their mind control and team up with the Megaforce Rangers to take on clones of the Rangers created from the Legendary Ranger Keys, and reclaim said keys. 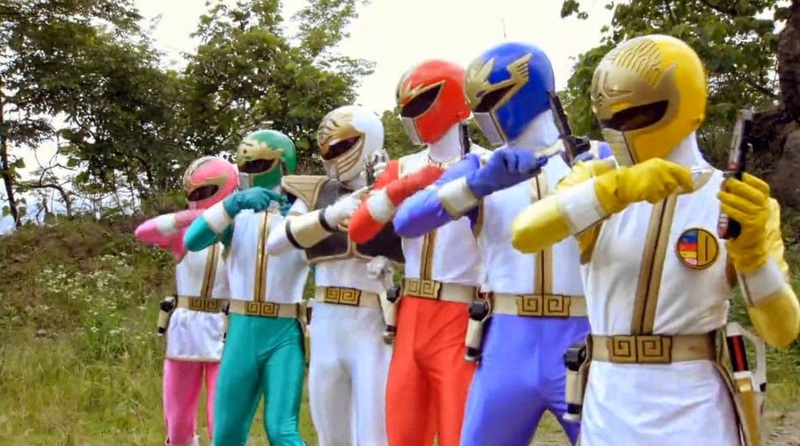 The pirates would then either give their Legendary Morphers to the Megaforce Rangers, thus justifying them having pirate-themed weapons, equipment, and Zords, or become a secondary group to supplement the team, making use of their ability to morph into previous Rangers. Hell, if they went with the former, it would be a better way to give Orion his own Ranger Key and Morpher: The pirates made them and gave them to him to go assist the Megaforce team. And yeah, in case you’re wondering, this WOULD make use of footage from the Gokaiger/Goseiger team-up movie, though with some additionally filmed footage…which brings me to my next point. I’m sorry, but one the bigger issues with Super Megaforce is the overuse of Gokaiger footage. Now, in some cases, it’s perfectly fine to use the Gokaiger footage, since it’s plenty action-packed with badass action scenes. However, some of these scenes definitely needed to be left out or edited better than they were. 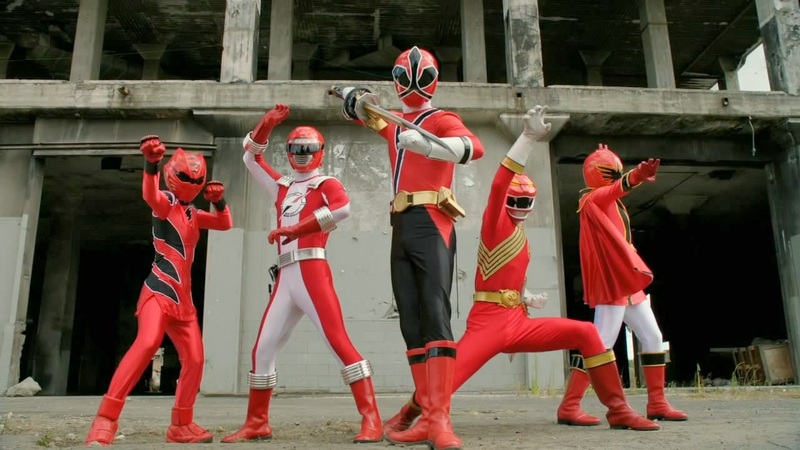 Specifically, stuff like Jake and Orion’s mannerisms not matching the footage used for them (and Noah to a lesser extent), and certain Legendary Ranger Modes that really shouldn’t have been included (seriously, that battle with Levira should’ve had them use different Legendary Rangers, though at least they had Troy go MMPR Red). 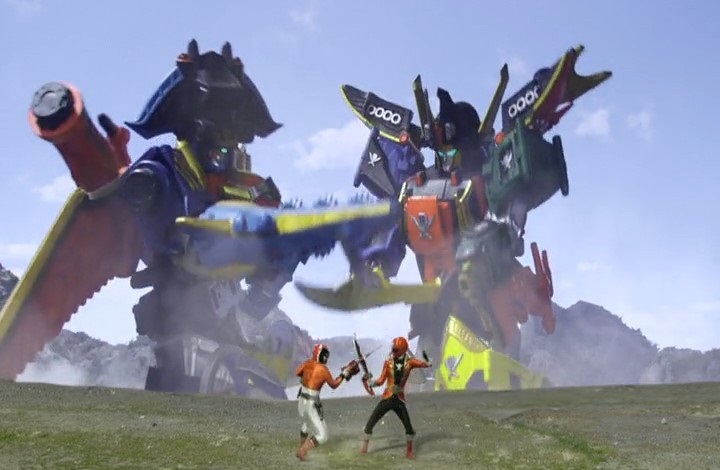 Now, on the flip side, there’s some moments in Gokaiger that weren’t used in Super Megaforce that I wish they HAD used. 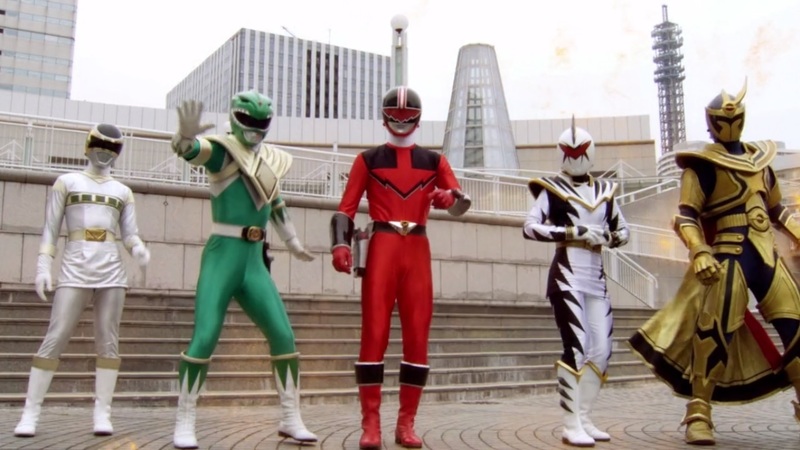 Time Force and Lightspeed Rescue were barely used at all in Super Megaforce, with I think only Jen and Chad’s keys being used to go Legendary Mode, and Quantum Ranger’s key used to summon the Q-Rex (which I assume is either a brand new version of the Q-Rex built by Time Force, or an upgrade of the original. Personally, I hope it’s the former, since otherwise, it means Eric doesn’t have a Zord anymore). 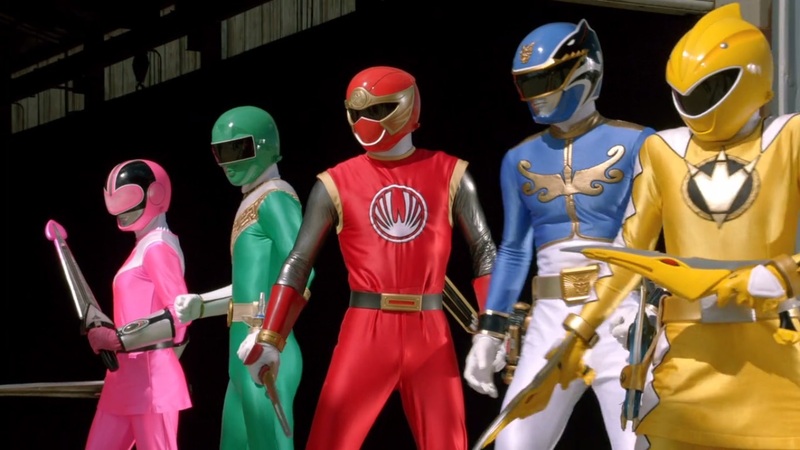 Plus, I would’ve loved to see certain Legendary Ranger Modes used, like Yellow Ranger Mode, Silver Ranger Mode, Sixth Ranger Mode, and so on. So, I suppose it’s really about having a better balance of old and new footage. 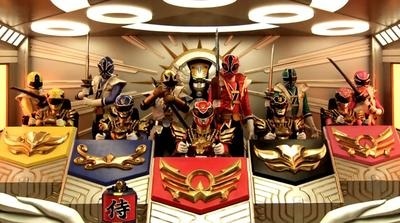 What I thought would’ve been a lot better than what we got for the Samurai homage episode would be a made-for-TV movie set in Megaforce, where Vrak takes control of the remaining Nylok forces for his own purposes. 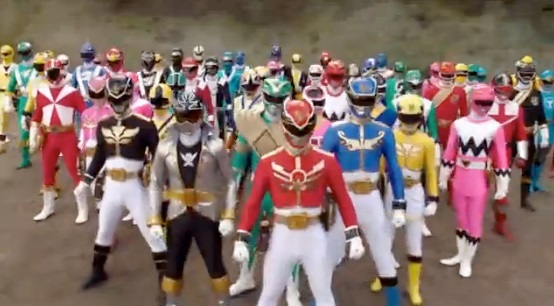 And yeah, I know that the last made-for-TV PR movie didn’t work out so well, but considering how they got most of the Samurai cast to make cameos in Super Megaforce, I’m sure they could get the whole cast back for this, and if it was more or less an adaptation of Goseiger vs Shinkenger, trust me, the story would’ve been a lot better than Clash of the Red Rangers. It’d have awesome stuff like…well…Well, just look! 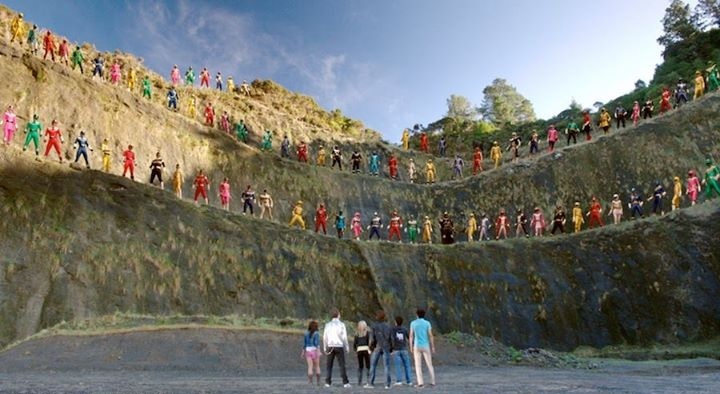 Hell, they coulda then made use of the episode of Gokaiger where they go back in time to the final battle of that movie (hence the Gokaiger debut being in that movie, which was set before the Great Legend War, when the Ranger Keys were created), where the Super Megaforce team has to do the same. Woulda been kickass. This is basically the best way I could think of to excuse the use of the Legendary Rangers who were Sentai teams that weren’t used for Power Rangers. In a nutshell, they would be short 5-15 minute episodes telling about the Rangers’ stories, their battles, who they were, and who some of their enemies were. They coulda been exclusives shown on Netflix, or the show’s website. Granted, this is supplemental material to explain something in the main series, which can be considered a failure in storytelling, but at least we’d have SOMETHING. They’d also be super-easy to make, too. And hey, after you’re done explaining the various Ranger teams used for Legendary Mode, they could then tell some more of the back-story for Megaforce, where the keys come from, and what the Legendary Rangers are doing in the middle of the battle with the Armada. So yeah, other than stuff I’ve already discussed (Jake’s stalker nature, the need for stuff to be properly explained, additional cameos) and little details that they got wrong about previous seasons (the island of the Wild Zords is called the Animarium, while the kingdom it once belonged to is called Animaria, and it wasn’t pronounced like you had people do in Super Megaforce), that’s all I got for now. Lemme know in the comments section below if there are any you’d add. Next time I talk PR, I think I’d like to discuss the future, which is honestly looking a bit brighter than the past four years have. 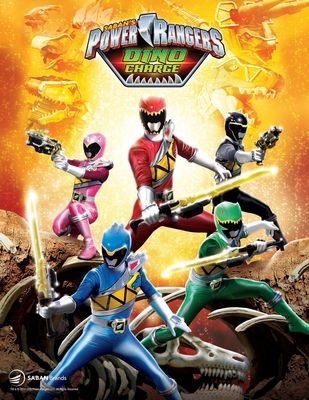 So, feel free to check back in then, as we unleash the power of Power Rangers Dino Charge. Ja né! So, as those who have been reading my fanfic, Power Rangers Guardians of Gaia, know, I’m planning to have a special one-shot fic posted before the end of October. It’s called ‘Power of Pink’, and it’s a PSA fic for breast cancer awareness (and don’t worry, it won’t preach too much or anything, and there will be plenty of action for you violence craving guys, lol). Why is it called Power of Pink? Well, as I said, it’s a breast cancer PSA fic, and pink is generally a colour well associated with breast cancer awareness. 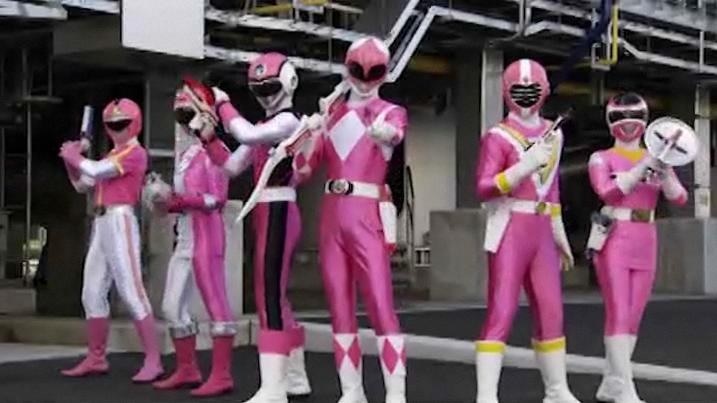 However, it’s also because, in a fight scene that occurs in the fic, the Super Megaforce Rangers will be using a Legendary Pink Ranger Mode, meaning all six Rangers will be Morphing into past Pink Rangers. Anyway, I’m gonna post this poll here, and whoever has the top six amount of votes will be the ones the team will morph into. If there’s a tie…I dunno, I’ll roll dice or something. lol Anyway, please vote, and hopefully, I’ll have the fic finished before the end of October. Oh, and by all means, please support breast cancer awareness, this is really important. Or heck, just cancer in general. Ja né!